On March 17th 2016, Shabudin Yahaya (BN MP for Tasek Gelugor) alleged that the Chief Minister of Penang, Lim Guan Eng was involved in the sale of two plots of land in Taman Manggis, Penang to a company whose owner was connected to the owner of a bungalow purchased by Lim Guan Eng. The purchase of the bungalow was alleged to have been below the market-price . Comparisons were made between these allegations and former Menteri Besar of Selangor, Khir Toyo’s case where he was convicted for abusing his power to acquire land and property below the market-price. Following these allegations, a series of exposes and more allegations surfaced online. MACC conducted investigations and on June 29th Lim Guan Eng was arrested and held overnight. On June 30th he was charged with corruption in the Penang High Court. His former land-lady, Phang Li Koon was also charged for her involvement. Since the story broke in March we tracked mentions of Lim Guan Eng, Taman Manggis, Khir Toyo and other related terms to gauge the response to the initial story and on-going exposes. 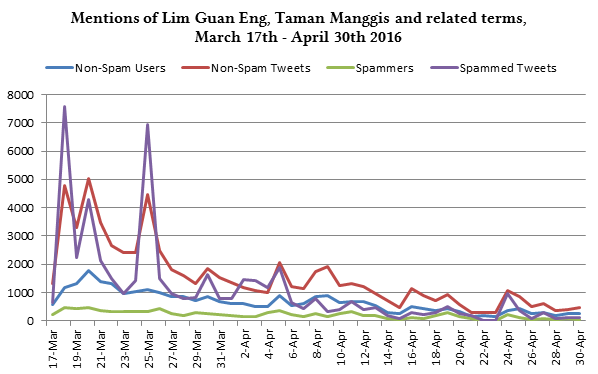 We initially examined tweets by 10,627 users from March 17th – April 30th 2016 mentioning the keywords related to allegations against Lim Guan Eng. What we found was the topic was popular mainly with users with a strong partisan interest in Malaysian politics. This issue did not draw enough interest from the general public – it was not worth talking about, and those who did tended to express disinterest or only retweet news articles. The topic also drew more interest from users based in Kuala Lumpur, Selangor and Penang. 59% of users tweeting about the topic (not including retweets) were based in these 3 states. The highest drop in interest was from users in Johor, which made up 8.63% of the local population (1.96 points lower than the proportional average). 1,358 users spammed 49,223 tweets. In other words, 12.8% of the users spammed 41.8% of the total tweets. Users complaining about excessive media coverage. Most complaints implied users were bored or not interested in listening to the repeated allegations. Users defending Lim Guan Eng were a small minority. There was little evidence of pro-DAP or pro-Opposition users being mobilised to defend Lim Guan Eng. Out of 44 DAP politicians actively tweeting in this period, only 27 politicians tweeted/retweeted tweets mentioning Lim Guan Eng or keywords related to the allegations. This does not include images or tweets not mentioning related keywords. By not talking about the allegations the 17 politicians missed an opportunity to contribute to Lim Guan Eng’s defence on Twitter. Because of the low level of interest from the general public and the high degree of spam, we could not do a detailed opinion analysis at the time. 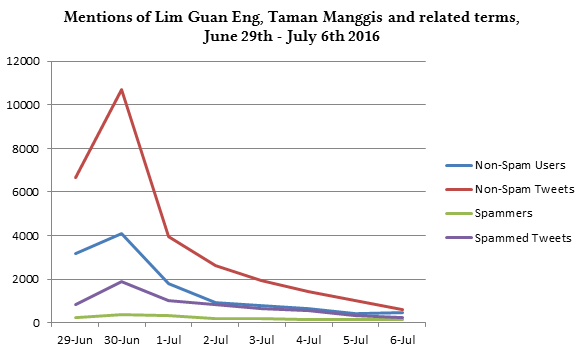 We examined tweets by 8,365 users from June 29th – July 6th 2016 mentioning keywords related to allegations against Lim Guan Eng. The daily interest is shown in the graph below. We then performed opinion-based analysis on 520 users based in Kuala Lumpur, Selangor and Penang. The margin of error is +/- 4.3%.